I find making fresh pasta an incredibly relaxing activity. I could fashionably say it’s therapeutic but I don’t feel the need to have therapy as often as having pasta. My latest passion in “pasta relaxation” is orecchiette, meaning little ears, a semolina pasta traditionally made in Puglia. It’s the sort of thing that gives a good excuse for gathering friends around a table and while away an afternoon. Do watch the video at the end of this post to see what I mean. That woman must have made so many orecchiette that does not even need to look at what she’s doing. It’s magical. I can’t produce them quite so fast, but it’s actually easier than it looks if you make sure to obtain a firm dough, use a round tipped knife and don’t get discouraged if the first batch of ten will look a little lopsided. As you get the hang of it you will wonder why you ever found it difficult. I make all doughs in the food processor as explained here . You can also make the dough by mixing all ingredients by hand until smooth and elastic as shown in the video below. It’s most important that you allow the dough to rest at least 20 min and up to one hour. This way the gluten absorbs moisture and makes the dough pliable and easy to shape. Once your dough has rested, transfer it onto a work-top. A grainy wooden cutting board or pasta dough helps grip the dough. Divide the dough into fist-size portions, and cover them with a cotton kitchen towel. Roll 1 portion of dough into a 1 cm (1/2 inch) thick rope. Use a knife to cut and drag a 1/3-inch piece of dough from end of rope facing you. Holding the knife at a 45-degree angle to the work surface, press and roll dough around the tip of the knife toward you. 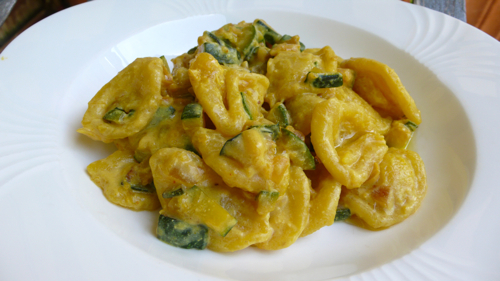 You will obtain something similar to gnocchi but empty in the middle. Now turn out each piece of dough over your thumb in the opposite direction to form a concave shape, and transfer onto the pasta board or a tea towel. Repeat with remaining dough. 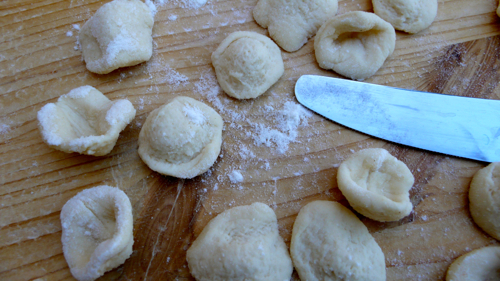 Orecchiette can be stored at room temperature in a single layer overnight. While the orecchiette dry, start boiling your pasta water and prepare this quick sauce in a saucepan which must be large enough to hold all the pasta once is cooked . Saute zucchini and onion in one tablespoon olive oil until just starting to become golden. Add cream (or ricotta) and saffron and simmer briefly until just warmed through. Cook pasta in plenty salted boiling water, drain, transfer in the sauce pan and toss with the sauce over high heat as explained here. Finish with grated Parmesan and a drizzle of good extra virgin olive oil. Serve immediately. Any extra unccoked orecchiette can be frozen. First, freeze them in a single layer on a plastic tray, then transfer them to a resealable plastic bag and return them to the freezer. Boil directly from the freezer. The pasta looks delicious! Thank you for sharing the video on how to form them. I would like to try them soon! lovely, thank you, it’s fun to make them! Every time I’ve attempted to make orecchiette at home, they turn out way too thick—now that I read your post, I realize that I may not be letting it rest long enough. Time to try again!